DECnet forever! My SIMH OpenVMS VAXen - QCOCAL (1.550) VAX Server 3900 Series in Washington DC and CLOUDY (1.551) VAX 11/780 in Kitchener, Ontario, Canada talk to the HECnet primary router MIM (1.13) - a real PDP-11 in Uppsala, Sweden running RSX-11M-PLUS and, through it, to numerous VAXen and PDPs across the world. My first SIMH VAX Server 3900 series has been up now for almost a year. I call it "QCOCAL", in memory of a real VAX I used during my stint with Digital Equipment Corporation. The new QCOCAL lives inside a Centos 7 virtual machine on my DELL PowerEdge 2950 in the basement of our house in the Washington, DC metro area. It is connected to HECnet - the global hobbyist DECnet, using the DECnet bridge program written by Johnny Billquist. Having recently procured a couple of Virtual Private Servers, I installed a second SIMH VAX-11/780 on one of them, calling the VAX "CLOUDY" (because it lives inside a cloud VPS). The VPS is hosted in a data-center in Kitchener, Ontario, Canada. A view of just internet connectivity of the servers and the simulated VAXen looks like Diagram 1. The NICs of the Linux host servers are bridged and then tun/tap taps are used to connect the SIMH Vaxen. This is because the SIMH simulator grabs the entire configured NIC and we cannot really let it have the host's NIC all for itself (more information see "CHAPTER 3: Creating a TUN/TAP Pseudo Network Device and Bridging to the Host Network Interface"). To facilitate DECnet protocol communication, the DECnet Bridge program grabs DECnet packets from the ethernet taps (i.e. 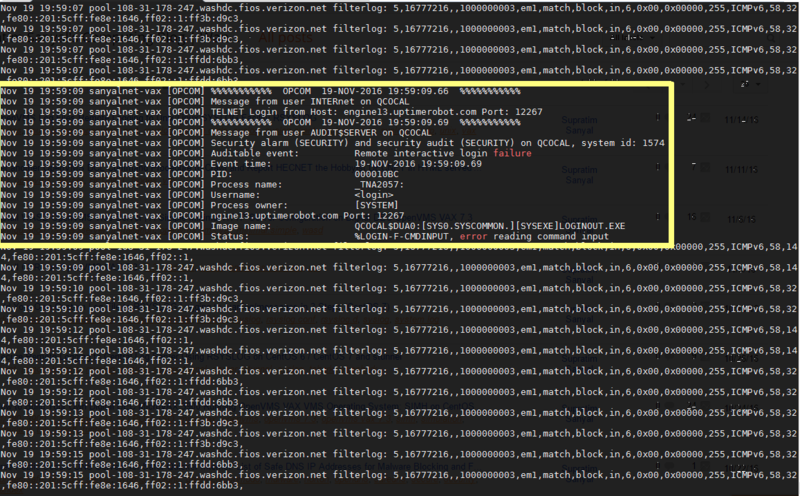 tap0, tap1), encapsulates them in UDP packets and sends them over the internet connections to be converted back into DECnet packets on the other side. Conceptually, it looks like diagram 2. Version = "V7.3 30-DEC-2000 00:04:42.43"
sanyalnet-cloud-vps2.freeddns.org on port 4712 which runs it's own bridge to DECnet end-node CLOUDY (1.551). I gather all the logs I can from my many hobbyist servers and systems in a central place on one of my Virtual Private Servers running a rsyslog logger daemon on CentOS 7. 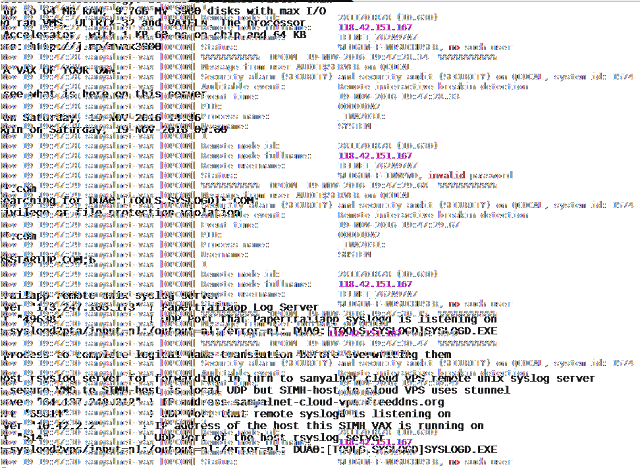 I wanted to add my QCOCAL hobbyist OpenVMS 7.3 VAX system logs to this central syslog server on my VPS. Fortunately, all the work has already been done by Doug O'Neal from Homewood Academic Computing at Johns Hopkins University, whose SYSLOGD.C program pretty much worked out of the box. The only tweak I made to Doug's SYSLOGD.C is to support a second OpenVMS Logical "SYSLOGD_PORT" to specify the UDP port number of my remote RSYSLOG Linux server, since I am not running it on the standard port (514). This is in addition to the "SYSLOGD_SERVER" Logical already supported by Doug's code. Some warning and informationals are generated by the compiler and linker, but nothing to stop SYSLOGD.EXE from being generated and used. You can also download the source and OpenVMS VAX V7.3 binary executable from my FAL area on QCOCAL over HECNET or over the internet from QCOCAL served by WASD. The OpenVMS SYSLOGD facility sends log content to the remote RSYSLOG server with no encryption, in cleartext over UDP. This is totally insecure - any rookie hacker could sniff the packets and learn a lot about what is going on with our OpenVMS server. We need to make the transmission of the logs to the remote server secure. Fortunately, I have recently setup a secure tunnel for logging to my remote central log server from my other hobbyist servers, as described in this post. This makes it really easy to secure OpenVMS log transmissions to the central server. First, I identified a syslog server on the local LAN that is already configured as a secure tunnel (stunnel) client to my central log server. I decided to use the same Linux host (10.42.2.2) that is running the SIMH OpenVMS VAX for this purpose. It is directly and quickly accessible from the SIMH VAX (10.42.2.5) because the SIMH VAX network link is just a tun/tap bridge on the same server. I opened up /etc/rsyslog.conf on this SIMH host Linux server, and uncommented the following lines to allow rsyslog to accept logger connections over network. The TCP syslog reception port did not really need to be opened up for this rsyslog daemon to accept log entries over UDP from SYSLOGD.EXE on OpenVMS VAX, but may come in useful for later projects. And here is the fun part. Since this rsyslog daemon is already configured to use stunnel to send logs securely to the remote server, the logs from OpenVMS VAX are also forwarded to the remote syslogd daemon over the same secure tunnel. Sure enough, checking my remote VPS central syslog server log, I see the OpenVMS VAX logs dutifully forwarded by the local SIMH host Linux box. HECnet is a DECnet that connects different people who play around with different machines that have the DECnet protocol suite. The network should not be regarded as a serious networking setup, nor should it be expected to work 24/7. It's a hobby project between people who think it's fun to create a DECnet network. HECnet is basically a DECnet phase IV network. Currently, the main router is a PDP-11 running RSX-11M-PLUS. The machine is located in Uppsala, Sweden. The DCL script HECNET-SCAN.COM to crawl HECNET and generate the HTML pages. You can run this by itself for testing, or invoke this periodically (once a day or once a week) from a scheduled batch queue job. This is what I did to bring up a minimal WASD web server on my VAX running OpenVMS 7.3. I did manage to have my website run from a separate user account than WASD and even link to my FAL$SERVER directory for HTTP access in addition to DECNET access to my FAL server. First, follow this post to install CPQ-VAXVMS-SSL-V0101-B-1.PCSI-DCX_VAXEXE and VMSPORTS-VAXVMS-ZLIB-V0102-8-1.ZIP. You should go ahead and follow the entire post to install CURL for OpenVMS VAX 7.3 anyway, CURL is a pretty useful tool to have on your VAX. The SSL version this obtained will remain unused by WASD but the installer will proceed. The installer will use ZLIB. Then head to the WASD VMS Web Services Download Page and download the latest version for WASD for OpenVMS VAX 7.3. I downloaded the latest version at the time of writing: WASD1102.ZIP. You can also grab it from QCOCAL over HECNET or now by internet, thanks to WASD, from here. Create a new directory WASD_ROOT on a device with at least 630,000 blocks free. I created DUA2:[WASD_ROOT], and this post is written to reflect that. Adjust according to your needs. Unzip the downloaded installation ZIP file into the new directory and run the install command file using @INSTALL. Follow the prompts and answer questions taking cues from a log the installation procedure I captured and saved here to build and install the initial working configuration of WASD. When the install.com procedure completes, start up WASD using @DUA2:[WASD_ROOT.STARTUP]STARTUP.COM and point a web-browser on another computer on your subnet to your VAX. You should see the default WASD web-site with no further configuration needed for the out-of-the-box installation. Use CTRL-Y to exit as instructed. Then change to the .LOCAL directory. In the .LOCAL directory, edit WASD_CONFIG_MAP.CONF and delete all lines. Add the following few lines only. Edit WASD_CONFIG_GLOBAL.CONF and replace with the following contents. This is intended to bolster security by turning off scripting support, narrowing allowed default HTML files to index.html, enable reverse DNS lookup, add missing MIME types for directory displays etc. 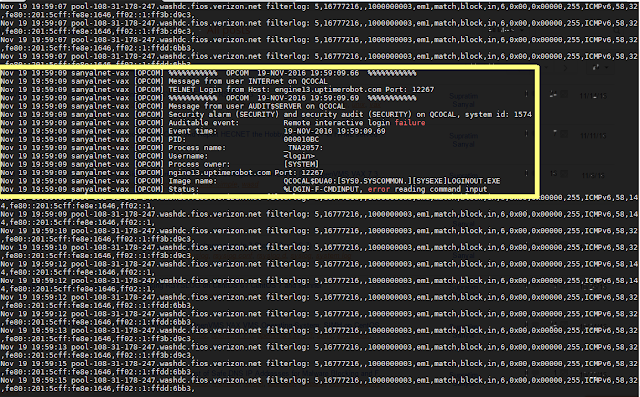 (DIFF with the .EXAMPLE version of WASD_CONFIG_GLOBAL.CONF to see the differences). Edit WASD_CONFIG_SERVICE.CONF and enable only HTTP port 80 on the WAN address for our minimal installation. No other configuration files need to be manipulated for our minimal WASD web server configuration. 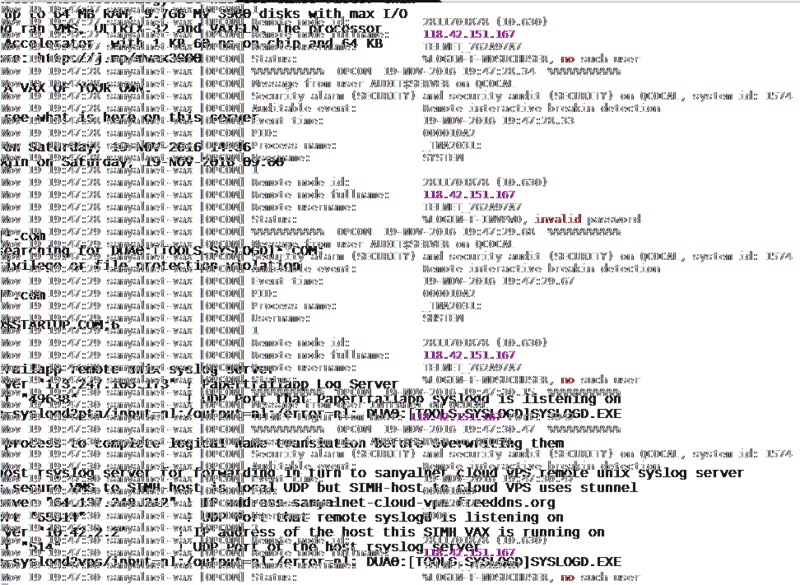 Also, my FAL directory is at DUA2:[FAL$SERVER] and that is what the falserver logical above reflects. Obviously you need to adjust for your FAL Server location. Again point a web-browser (remember to Shift+Reload on your browser to force a fresh non-cached request) on another computer on your subnet to your VAX. You should now see tiny test html page. Clicking on the FAL AREA link should show the files in your FAL$SERVER directory. There are some fabulous folks at the comp.os.vms newsgroup that are always ready to help. For example, this post came in extremely useful for me when I was struggling with HTTP 403 errors.